Sigh… L.L.Bean clothing is NOT frumpy. It can be frumpy, but so can clothing from 3.1 Phillip Lim. Frumpy is the person, and the way things are worn, not the garments themselves. Some accessories, some attitude, some good posture, and these clothes will look as chic as anything that costs 10 times as much. Make your own style! UPDATE: I welcome all comments. You don’t have to love what I do – it would be impossible for me to create web posts that everybody loved. But everybody IS welcome to come by here, share their opinion, read the opinions of others, have a laugh or two, pick up something to think about, and stop back another day for a post that might be more to their taste. As long as everybody stays civil, I say let the conversation continue! Whew! This is just one brand of clothing – I think it’s clear that there are virtually limitless possibilities inherent in the baker’s dozen, carefully curated and deliberately distilled. Janice, I'm convinced there must be a half-dozen of you. NO idea how you have time to have a job and a life and generate all these incredible blogs everyday. I've never ordered anything from LL Bean, and I mean never, that I didn't send back (I'm the proof in the pudding that squat, un-slim bodies can not look unfrumpy, no matter the attitude or accessories in Bean clothes), but the ideas here are brilliant and easily converted to other clothing lines that are more slimming and flattering to me. I love the concept of "carefully curated and deliberately distilled" and have tried to make it my mantra–at least in my suitcases. I've already confessed that my closet curating is always going to be more look, style, and color of the day than wardrobe minimalism–but I've become much more ruthless about disposing of color-of-the-day mistakes. As always, thank you for being daily addiction to me–and to so many. You are so right about your 'frumpy' observations. In Germany there is a saying that if your shoes and your hair are in good shape, you can fudge a little bit in the middle. I have a closet full of plain simple clothes and very few stand-out pieces. And it makes much more sense to spend more on plain clothes as they will age so much better. Thanks for including navy! I'm digging out my LLBean catalog today and planning for warm weather I think! It's raining here today, turning the snow into slush. The temperature is that chilly (not cold, not fresh) 40 degrees. With each baker's dozen, my delight escalates and the only thing I can think of is that the L.L. Bean flagship store is a mere two hours from me. The ensembles do seem somewhat… uninspired. Where are the prints, the interesting shapes, the embellishments? All summer I see women wearing solid-color, basic-cut t-shirts and neutral shorts or capri pants — clothes exactly like what you show here. 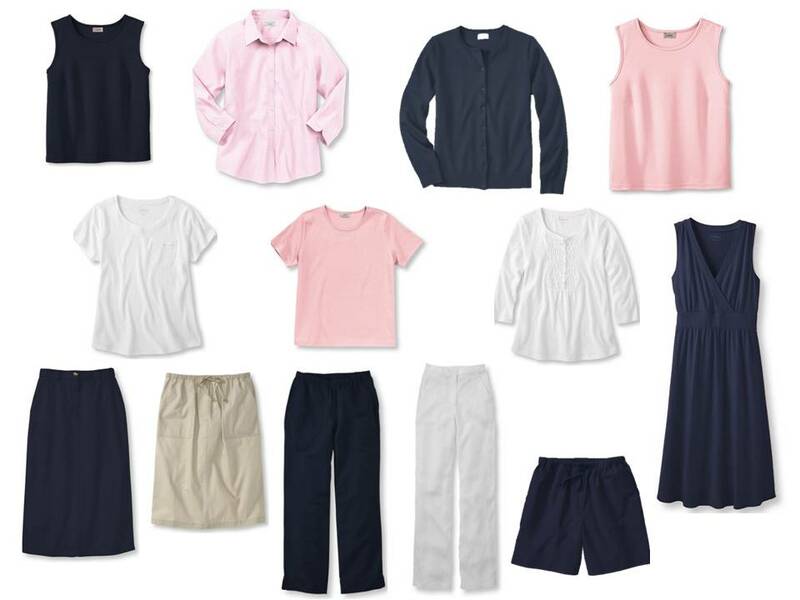 Anyone can pick a half dozen basic tops and bottoms out of a catalog, and this blog usually delivers so much more than that. I know the point of these ensembles is to be able to just throw something on without an effort, but sometimes you get out of something what you put into it. One has to remember that this is a foundation wardrobe, like her winter common wardrobes. Remember how she took those and built on them with accessories and additional pieces in accent colors. I would think that the same concept applies here. If you've been reading this blog for a while you will see that it is the carefully chosen accessories that provide the bling, the individualism. My reading of this series of wonderful wardrobe basics is that these garments form the basis of a summer wardrobe — just grab something and add shoes, scarf, jewelry, and purse. Most likely you already have an accessories wardrobe to go with these basics — or now you have a reason to add a few more — something interesting in cinnabar, maybe. Where are the prints, the interesting shapes, the embellishments? Not at LL Bean. These are sort of blah, nameless, shapeless anonymous clothes. It is wonderful that there are so many fashion blogs out there for all those who seek something else. Meanwhile, Janice, all of your faithful readers know you are just warming up. Well said Janice, yes L.L. Bean is not "Frumpy" if it is worn with the right attitude. I have brought clothing from them in the past and as with all clothing some fits and hangs better then others but for basics they can't be beat. These are just the core of a summer wardrobe – the basis upon which something a bit "snazzier" can be built. 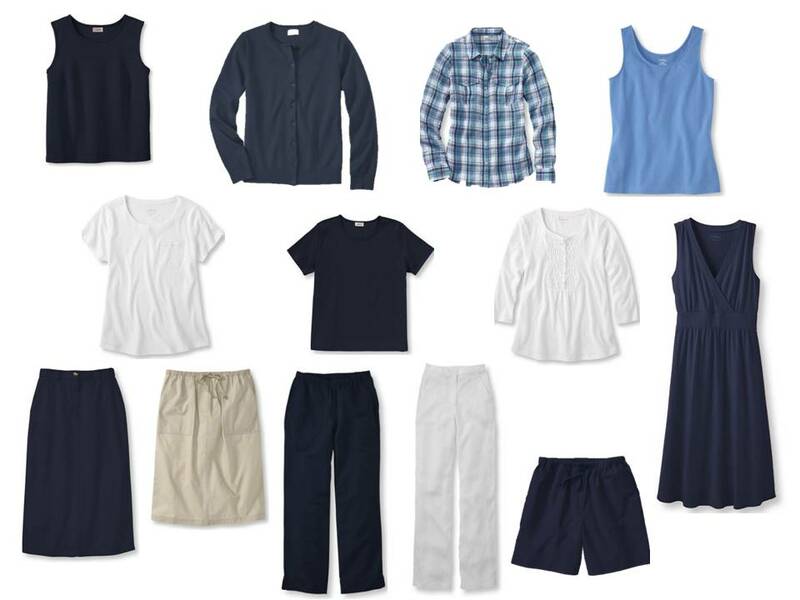 For many of us, these kinds of choices seem obvious, but the feedback that I get suggests that some of my readers really benefit from seeing a simple, uncomplicated, basic start for their summer clothes. More accessories and juicy embellishments will follow, I promise. I think the basics are exactly as Janice describes…basics. It's up to us to use our minds and make them work for us. Thank you Janice for the amazing work! Oh – thanks for the heads up, Anon! I think my husband has been overselling the weather so I get more excited about the trip in advance. LOVE these color variations. But what about a summer in the deep south, no long sleeves variation? Pretty please? The long-sleeves are provided to serve as an over-layer indoors, in freezing cold air conditioning. If you're never going to need them, just substitute a couple more sleeveless tops and you'll be (un)covered! You must have the LLBean catalogue memorized by now 🙂 I agree they have some really good stuff, the only challenge is the cost of returning items that don't fit properly. Here in Canada it costs money to send the stuff back which make shopping the online U.S sites a little tricky. Your basic wardrobes are such a help, they keep me focused. I plan to print some of them to use as a handy reference whiel I sort out my wardrobe. I too live in Canada and when ordering from LLBean email them for the exact measurments of the item I am interested in in two likely sizes. Ask them for the measurement points that your particular body type usually has issues with. eg. waist, hips, bust, shoulders, sleeve length. Just recently found this site. Janice, I think you are an inspiration! Thank you for all the hard work putting together so many options. It helps me to see how I can "shop my closet" and find new outfits. Sharing the affection for Bean, Janice. I wear their sailor shirts, one third the price of the designer ones and every bit as good. Cara and Anonymous, suggest you add an *very high quality* lightweight scarf- Pucci, Hermes, Paul Smith, Vivienne Westwood. Wear around neck or tie on bag. Or a pair of the new spring Cole Haan driving loafers, which come in pungent shades. Or a big Bittar cuff. One can also add some snap by shortening Bean's full-length pants from the conventional full-length to barely cropped, a length that hits just at the mid-ankle. It will totally change the attitude. LauraH: With free shipping *to* Canada, Bean is still cheaper than most online retailers. Not many offer free returns. I agree. I wear sailor shirts and linen shorts from Bean's. They are excellent value. And I have shortened the pants to ankle length as well. With espadrilles and moccasins (I like Minnetonka), they look pretty chic in summer. What a great starting point for a summer wardrobe. I never seem to apply the focus to summer clothing that I do to Fall/Winter. Now that I live in California, I really should make this a priority. Not sure if Bean fits me but it sure is worth a try for basics. Love the black and blue combo. Might try it with red. Thanks Janice! You Rock!! Janice, love these and have one question for you! That blue sundress is perfect – exactly what I have been looking for, but at LLBean, I am exactly between the measurements for medium and large. I would prefer it be a comfy fit, but clothes that are too big are sloppy and often expose undergarments, which I would prefer to avoid. So the question: at LLBean, better to size up or down? How generous or exact is their clothing cut?! I'd size down, but honestly, the easiest thing to do might be to order both sizes and then return the one that doesn't work. That's what you'd do in a store, only this way, you get to do all of the trying-on and fussing about in the comfort of your own home! The last time I bought something from LLB, I talked to the operator for quite a while. Apparently they have notes on the fit of each garment. Most of their clothing is sized larger than average but that's not a given. I'm very glad I talked to her. It was worth the extra time. May I chime in to say that I think I "get" what Janice is trying to do here, and that I think it's brilliant? In a way it's turning the old adage — invest in the best quality basics that you can afford, and jazz them up with cheap(er) accessories — on its head. It's similar to what Janice does in building an outfit around an Hermes scarf — when you're wearing a beautiful scarf, everything else you're wearing takes a second seat, and that's how it should be. I'm a sucker for coats anyway. In GD's words, "I wish we never had to take them off." Summer clothes aren't meant to last as long as clothes in winter fabrics, so I've looked at my summer wardrobe as a one-season, possibly two-season, wonder most of the time. Genevieve supports this notion, too. I have to admit that my first reaction to L.L. Bean here was with some trepidation, but then Janice has once again shown us the possibilities. Thank you, Janice! I'm devoted to L.L.Bean for a couple of important reasons – I KNOW that their clothes are good value for money. I do NOT have that experience with J. Crew, as much as I know that lots of people adore their looks. Some of their things are not well-made, and are very expensive for the length of time you'll actually be able to wear the clothes. And I like them because I know their things WON'T go out of style, because they're really not ever IN style – they're just clothes. Just the simple backdrop for your own style, when you get it defined. Perhaps I am just being lazy! Janice not only are you the best 'wardrobologist' out there, you have the best sense of humour as well! Thanks. I know what works for my body and wallet. Rather than food for thought, I need sources for decent quality clothes cut to fit a woman with a little flesh, and am receptive to any maker out there who can deliver it. There is very limited time that I'm willing to spend online- and prefer not to spend any of that "wading through dross" on Pinterest or elsewhere. I am grateful for this blog. My turn to chime in. I think in regards to Cara, Anon and the 2nd Anon (who is afraid to be eaten alive – and says that it's impossible to have a different opinion on this blog) that you all are looking for something other than what is being offered here. You are looking for someone to give you style and personality. No one can give you that except yourself. How do you do that? You do that through your accessories, through your color choices, through your hairstyle, etc. etc. If you are looking to only wear stand-alone pieces, this is not the blog for you. If you are looking to have a basic wardrobe to which you can add your own touch/style/twist, this is the blog for you. I don't need help with the details – that's the fun part! I just want help to find the basics underneath to support what I decide to add to the wardrobe. If you think this looks like frump, then you don't have the right accessories. Go find some and have fun!!! I bet you won't look frump!! In fact, I bet you will be dressed better than the majority of people I see. Wow, no wonder Anon is afraid of being eaten alive! Did not read in Anon 2's comment anything about being impossible to have a different opinion on this blog, but definitely the emotions are running high! You can respond to my comment without psychoanalyzing me. By no means am I "looking for someone to give me style and personality." I just find it hard to believe that Janice's readers can't page through an LL Bean catalog and pick out a dozen basic t-shirts and shorts in their favorite colors. I am a longtime reader of this blog though I rarely comment (and surely I will go back into my hole now that I understand that different opinions aren't welcome). I think Janice has an eye for special pieces and a gift for putting them together in a way that is thoughtful and interesting. This "whatever's clean" series is such a departure from that, at least that's how it struck me. This does look like a departure for me, and partly it's in response to some very basic questions that I receive a lot; some of my readers want some very basic starting points upon which to build wardrobes, and I'm trying to answer those questions. But these really basic ideas are also going to be the springboard, or the foundation, maybe, for some more interesting things, I hope. I was planning to do some more accessory grouping, and toss them against these basic garments to see how a variety of accessory choices could give a different feel to a shared wardrobe of simple garments. I hate to disappoint any reader, and I do try to accommodate as many different requests as possible. Within the guidelines that I have to keep my day job, and my sanity! Your comments are always welcome, even if you're not loving what I'm doing right now. I encourage discussion and self-expression; if you can't do that here, then I've failed as a blogger. To Anon at 2:38 PM: You make some very good points. It all eventually comes down to personal taste. But I'm betting you haven't been reading on this blog very long, because not too long ago readers were complaining that Janice was showing too much designer stuff. 😉 Janice is really the embodiment of the word "open-minded" and this blog is meant to inspire, wherever you find inspiration — there's something here for everyone. ROFLOL! At least we are talking! I find the idea of these core wardrobe pieces to be fantastic. 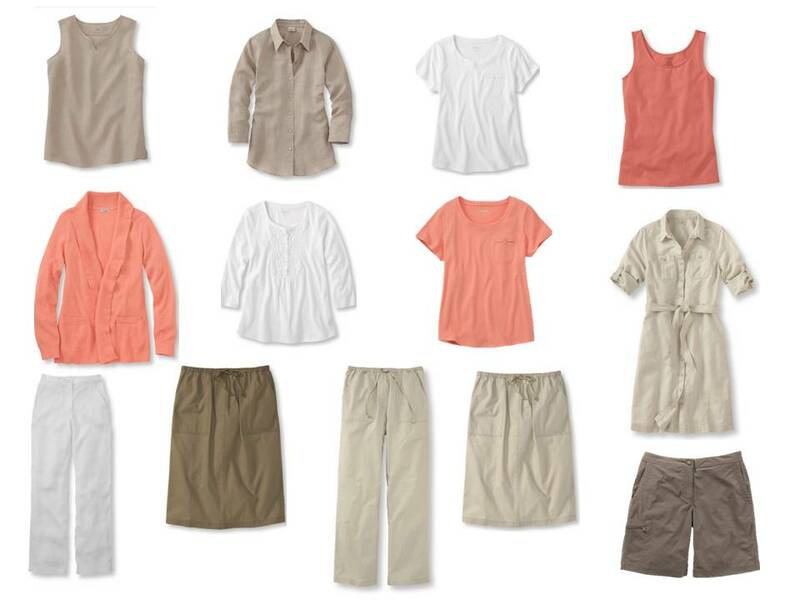 It's a great way to imagine a simple, easy start to my summer wardrobe. I have a lot of these pieces already. However the concept allows my to go through my stuff and see what needs to be edited and added. I live in the deep south and go through my summer clothes in a season or two – no matter how much a spend on them. I probably won't fill in any gaps with the LL Bean pieces (although I'll take a look). Instead, I'll substitute the pieces of clothing in brands that work for ME and my body and style. For example, instead of the white t-shirt from LL Bean I'll substitute the JCrew "perfect v-neck tee" because it's my favorite. Instead of the blue t-shirt from LL Bean I'll pick the linen jersey t-shirt from Eileen Fisher. Instead of the black pants from LL Bean I'll substitute some skinny crops by Talbots. You get the picture. Perhaps your white t-shirt is an oversized tunic, your black pants are leather leggings, and your blue shirt has studs on the collar. I will attempt to use everything that Janice has taught me and make it mine. And then, I'll start with the accessories! I don't think this exercise is about the brand (Bean) but the idea of taking a limited color pallet, simple shapes and styles and finding a multitude of options. Saving you time and money in the long run. I must add my tuppence as these comments are so interesting. Janice, I loved these summer basics, most particularly as I am in the middle of the hottest Australian summer I can remember, and I could see myself buying the whole caboodle in one of the colourways (I wish llbean did more grey options so I could do grey white and navy). The options are affordable and simple and would really work in the hottest summers. No, they are not stunning, but Janice always shows us how to make that happen, which is why I love her work so much. Christina has got the same thoughts as I do. I believe the idea here is to see how some core pieces fit together to form a working wardrobe. The flair and style is what each person adds to the foundation. Good work Janice. Janice – Please don't hesitate from venturing into the basics theme more in the future. I have been reading, and loving your blog for a while now and this Summer Basics series has been a wonderful breath of fresh air. It feels so approachable and simple…it makes me want to pack a few simple pieces and head off on a summer adventure! Thank you!!! I'll second that. I feel possibilities with this latest, Janice. It's fun and you are so, so smart. You're making me look outside my box, seriously. It's the genius thing of simplicity and basics, so you feel like, okay, I've got the solid, core stuff…now I can have fun with earrings or sandals or a scarf belt or Whatever. Lead us on, Janice; like I said, you're the fashion guru for me! I really like seeing all these basics–a good reminder for me. Sadly, LLB clothing has–so far–proved not to be a good fit for me. I have the LLB visa card because it provided free shipping before that was extended to all. AND it provides free returns. Something to keep in mind if you are not sure of size. I ordered my son 2 pairs of boots…and then a third in order to get a good fit. thank you for your marvelous blog! I've been following it for about six months now, and every blog is a delightful surprise and eye opener, and I've learned so much from your ideas. Of course not every suggested combination or colourway is suited to me personally, but I can still appreciate it in the greater scheme of things. I think your current series of wardrobe basics is great as are all other past ones. The brand of clothes it is based on (and the discussion that it created for some readers) is quite irrelevant to me as I live in Australia. I can readily substitute both brands and quality to my likes and budget, it's not that hard. 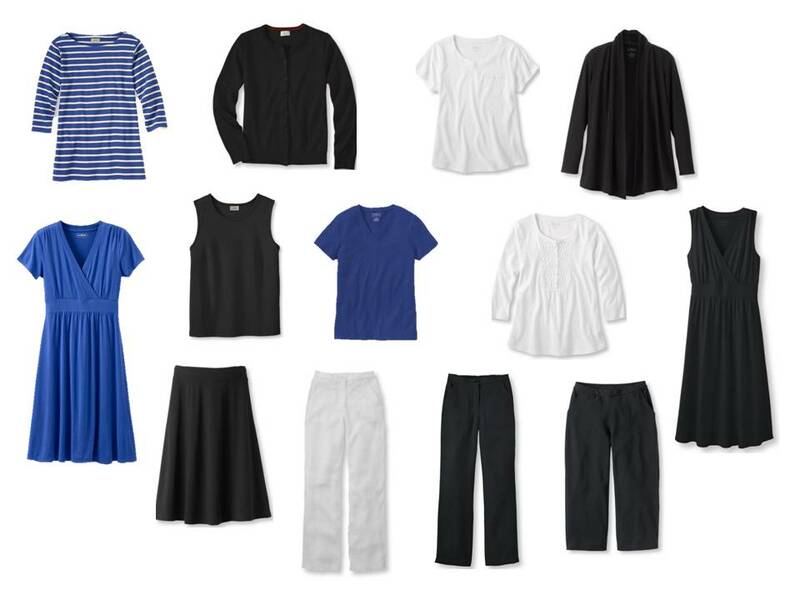 Specifically, your basic wardrobe items are great for a 'basic' travel wardrobe and I will base my packing list on it for an upcoming two month trip to Europe. I will need to plan for both cool and hot weather, so a layered approach is called for. If space permits a few special items will be added along with accessories to spice things up a bit. Thank you again for your inspirational blog and hard work! I really do not understand the brouhaha about LL Bean’s clothes. The justifiably acclaimed Common Wardrobes could easily be bought entirely from Bean. So why all of the fuss now? Is it because you prefaced the introduction of the Common Wardrobe with a discussion of your observations of Europeans? Uh-oh, that sounds elitist. Yes, I’m hyper-aware of these tendencies these days, but I do wonder if that’s what’s going on with the current detractors. In fact, I’ve come to realize that I’ve been dressing with a slightly modified Common Wardrobe for several years now. It has evolved gradually and subconsciously and the deciding factor for most of my purchases has been cost. It’s a Common Wardrobe primarily from WalMart! The lesson learned is that a core wardrobe can come from whatever source works for you. My way saved my very limited money for those items with “spark” and “edginess” and I didn’t waste time fruitlessly slogging through Pinterest postings. Your blog is so much more delightful and full of inspiration. A lovely way to start my day. I wanted to chime in with yet another voice of support. I love seeing these basic, basic sets of clothing. It is really great to have pieces that all work together, whether from LL Bean or not. Your sets are great visual reminders of how clothes can be mixed, matched, and remixed again. I have taken to making sure that any clothing purchases I make, regardless of price, will work in multiple ways. LL Bean's sailor shirts are fantastic in both the boatneck and turtleneck versions. Lovely solid fabric and well cut, they do not shrink either. I just bought several t-shirts from Muji and would recommend them too – pretty colors, a thickish knit, and well cut. Thank you for all your hard work, gracious attitude, and inspiring posts! When I see this series I think of Audrey Hepburn in her white blouse and black capri pants. So basic…yet stunning. I have been looking for common pieces for several years now and recently discovered LL Bean sleeveless tee shirts. They are divine and come in lovely colors that go with jeans or dress slacks. I deeply appreciate your free fashion wisdom Janice and your tenacity to appeal to all of us regardless of our tastes! I can't imagine the money a fashion consultant would charge for this kind of detail! Hoping to use your warm and peachy suggestions as a basis for my warm weather wardrobe. I've been downsizing and upgrading since I began to use your blog to pack for Ireland last fall. That capsule wardrobe, with a few additions from my own closet, carried me through the winter. And I never got bored with the items. Your suggestions, like those above, make a wonderful canvas which becomes the background for accessories that show my personality. I also love your weekend travel wardrobe guides- even if I never get to Paris or Milan- because they highlight how versatile these capsules are. Oh, and lest I forget, I have pinned some of your capsules on my Pinterest page (with appropriate reference to your blog) and they continue to get hits long after pinned. Thanks again, Janice. My LL Bean catalogue just arrived. This is a bit of a departure, but I'd love to see a men's version of this. My husband loves colour and has a real mish mash of clothing. He has also unfortunately put on a little weight, making his beloved desigual shirts too tight for the moment. I would love to help him put together a basic wardrobe, pepped up with bright accessories, that will help him get through this overweight moment in life fashionably, but without having to buy many clothes that result in very few outfits. Ideally, he would be converted to the simplicity and edit his wardrobe more carefully for life! I agree with Lauren, would like to see a corresponding mens' weekend capsule! My boyfriend could use some updating to his style for business casual/casual dress. Janice. could you be persuaded to take on this challenge of a menswear post? Another Australian here who just LOVES your posts, Janice. They give me a little lift each day when I check in with my email. In fact, I have a specific file in Windows Pictures devoted to Vivienne's Files!! I'm looking for colour combination inspiration,taking me out of my comfort zone. A recent combination that included a pale shell pink (a colour I don't think of as I usually lean towards brights and strong neutrals) has got me thinking seriously about being more adventurous. I am really grateful for the effort you put into your posts each day. Like someone else, I have been wondering how you do this AND hold down a job (plus be a normal human every day!! )We are in your debt. Janice, I'm LOVING these wardrobes. Such inspiration! I really enjoyed this post and particularly the conversation it has sparked! I loved each of the variations – and could easily use them to sort out some of my summer clothes to ensure I always have something to wear. Using Cara's and the Anons' comments as a jumping off point – I realized that as I looked at each capsule I imagined shirts tucked in, great belts, cross body bags or totes and summer scarves with each look. I agree with the comments that the items on their own could appear somewhat boring but I don't think many of us would wear these outfits on their own. I personally ascribe to a three piece outfit – bottom, top, and another piece (blazer, cardigan, scarf)plus other accessories to make an complete outfit. So using the capsules above, I would never likely wear just a plain tee with a plain pairs of shorts without some other 'verve' items! But I do appreciate how Janice managed to distill the capsule down to the essentials. I like Lands End and Eddie Bauer more than LL Bean as I find the clothes a little more interesting (and Lands End in particular is the same price range). I do like having a closet full of basics that I can add a pretty scarf or a bright cardigan and a necklace and add some interest. Great inspiration Janice. I live in Asia, where it is either hot and humid or hot, humid and raining. As such I have been anticipating your Summer basics post(s) and you did not disappoint. My 333 is 33-12 and although I love my black, white and beige I have wanted to extend my basics to include more colors but never have because I couldn't visualize them. Your variations are wonderful and I can't wait to see the ways you expand on them. Thanks for the time and effort you put into posts your ensembles, I know they're not whipped up in seconds. I truly would be horrified if you thought this blog had run it's course, as per an earlier comment, and I don't think I'm alone. Thanks for your style, grace and hard work. This woman I know has a signature green trench with matching purse. It is stunning. She looks stunning in it. Not until I perused the LLBean catalog would I have ever guessed the trench came from LLBean. I just want to know where she got the purse! 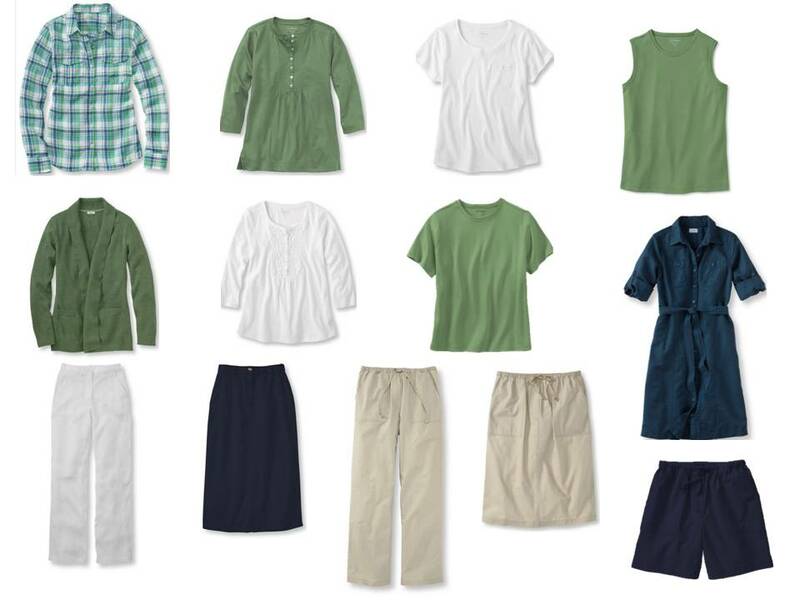 While Janice tells us to find clothes that flatter our body shape, and LL Bean may not flatter you, she is doing many women a great service by offering up their clothing. I have tried many a Burberry trench, and my friend's look exudes quality like the Burberry, but with a pop of color at one tenth the price. My brother had a theory that sometimes the best clothes for us aren't always our favorites, but the ones that we keep putting on because they look good on us, and they are comfortable. For those that prefer a more modern cut, LLBean has a new line, I believe it's the signature collection. … And all this from a girl who grew up in Bean country and has only bought outdoor/camping stuff from them. Didn't think it was my style, but I am praying their trench fits me! So I am doing christmas shopping, and I am looking for built in wardrobes narellan. Any sources or suggestions? Thanks for the help!